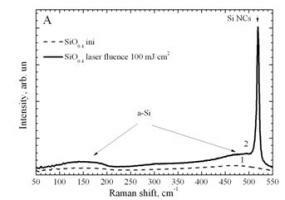 A femtosecond pulse laser irradiation (Ti-sapphire laser, 800 nm wavelength, <30 fs pulse duration) was applied for treatment of SiOx films of various stoichiometry. The as-deposited and treated films were studied using Raman spectroscopy and electron microscopy techniques. The laser assisted formation of amorphous Si nanoclusters in SiOx films with stoichiometry parameter x close to 2 were observed. We found laser fluence for crystallization of amorphous Si nanoclusters in SiOx films with stoichiometry parameter x < 2. The approach we developed can be used for the modification of size and phase composition of Si nanoclusters in SiOx films that were deposited on various substrates.